This York mirror makes for a visually-striking focal point of any room with its silver finish and metal frame construction. Get ready for the day by having the York mirror in your bedroom. It features a high-quality plain glass beveled mirror. The metal frame features a visually-striking silver leaf finish. 12" wide x 24" high x 1" deep. Hang weight is 3.84 lbs. Silver leaf finish. Metal and MDF frame construction. This is a nice mirror. I did read the measurements but clearly didn’t envision it accurately as it is way smaller than I was expecting. I kind of regret paying what I did for it given the small size but decided to keep it as it matches my living room and fits the wall it was intended for. 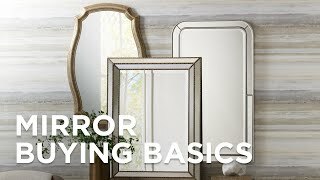 A hint of Early American styling makes this framed rectangular wall mirror a fabulous choice for more traditional decor. Upbeat and updatedthe design of this framed rectangular wall mirror brings an invigorating touch to a bathroom or dressing area. A perfect accent year &#39;roundthis sculpted metalantique silver wreath wall mirror is inspired by the crisp fallen leaves of autumn.